Father Gabriele Amorth the Chief Exorcist from the Diocese of Rome recently died at the age of 91. He performed thousands of Exorcisms. In one of his books he revealed the secret to being free from the Devil. It is really not something one says but rather keeping oneself free from sin and striving to live a Holy life. He noted in particular that Regular Confession and reception of the Holy Eucharist are most important. The following prayers were recommended by Fr. 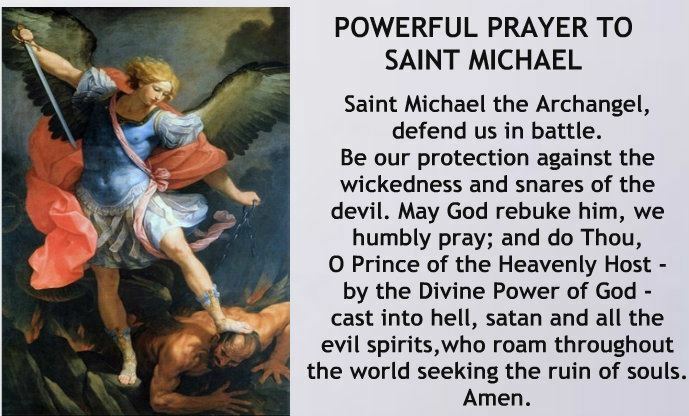 Gabriele these prayers should be said together with the Our Father Prayer and the Prayer to St. Michael the Archangel. Kyrie eleison. God, our Lord, King of ages, All-powerful and All-mighty, You Who made everything and Who transform everything simply by Your will. You Who in Babylon changed into dew the flames of the ‘seven-times hotter’ furnace and protected and saved the three holy children. You are the doctor and the physician of our soul. You are the salvation of those who turn to You. We beseech You to make powerless, banish, and drive out every diabolic power, presence, and machination; every evil influence, malefice, or evil eye and all evil actions aimed against Your servant [name of person/s]. Where there is envy and malice, give us an abundance of goodness, endurance, victory, and charity. O Lord, You Who love man, we beg You to reach out Your powerful hands and Your most high and mighty arms and send the angel of peace over us, to protect us, body and soul. May he keep at bay and vanquish every evil power, every poison or malice invoked against us by corrupt and envious people. Then, under the protection of Your authority may we sing, in gratitude, ‘The Lord is my salvation; whom should I fear? I will not fear evil because You are with me, my God, my strength, my powerful Lord, Lord of peace, Father of all ages.” Yes, Lord our God, be merciful to us, Your image, and save your servant [name of person/s] from every threat or harm from the evil one, and protect him/her by raising him/her above all evil. We ask You this through the intercession of our Most Blessed, glorious Lady, Mary ever Virgin, Mother of God, of the most splendid archangels and all Your saints. Amen! 2. Anima Christi Soul of Christ, sanctify me; Body of Christ, save me; Blood of Christ, inebriate me; Water from the side of Christ, wash me; Passion of Christ, strengthen me; O good Jesus, hear me; within Thy wounds, hide me; let me never be separated from Thee; from the evil one, deliver me; at the hour of my death, call me and bid me come to Thee, that with Thy saints, I may praise Thee forever and ever. Amen. 3. Prayer Against Every Evil Spirit of our God, Father, Son, and Holy Spirit, Most Holy Trinity, Immaculate Virgin Mary, angels, archangels, and saints of heaven, descend upon me. Please purify me, Lord, mold me, fill me with yourself, use me. Banish all the forces of evil from me, destroy them, vanish them, so that I can be healthy and do good deeds. Banish from me all spells, witchcraft, black magic, malefice, ties, maledictions, and the evil eye; diabolic infestations, oppressions, possessions; all that is evil and sinful, jealously, perfidy, envy; physical, psychological, moral, spiritual, diabolical aliments. Burn all these evils in hell, that they may never again touch me or any other creature in the entire world. I command and bid all the power who molest me – by the power of God all powerful, in the name of Jesus Christ our Savior, through the intercession of the Immaculate Virgin Mary – to leave me forever, and to be consigned into the everlasting hell, where they will be bound by Saint Michael the archangel, Saint Gabriel, Saint Raphael, our guardian angels, and where they will be crushed under the heel of the Immaculate Virgin Mary. Amen. 4. Prayer for Inner Healing Lord Jesus, You came to heal our wounded and troubled hearts. I beg You to heal the torments that cause anxiety in my heart; I beg You, in a particular way, to heal all who are the cause of sin. I beg You to come into my life and heal me of the psychological harms that struck me in my early years and from the injuries that they caused through my life. Lord Jesus, You know my burdens. I lay them all on Your Good Shepherd’s Heart. I beseech You – by the merits of the great, open wound in Your heart-to heal the small wounds that are in mine. Heal the pain of my memories, so that nothing that has happened to me will cause me to remain in pain and anguish, filled with anxiety. Heal, O Lord, all those wounds that have been the cause of all the evil that is rooted in my life. I want to forgive all those who have offended me. Look to those inner sores that make me unable to forgive. You Who came to forgive the afflicted of heart, please, heal my own heart. Heal, my Lord Jesus, those intimate wounds that cause me physical illness. I offer You my heart. Accept it, Lord, purify it and give me the sentiments of Your Divine Heart. Help me to be meek and humble. Heal me, O Lord, from the pain caused by the death of my loved ones, which is oppressing me. Grant me to regain peace and joy in the knowledge that You are the Resurrection and the Life. Make me an authentic witness to Your Resurrection, Your victory over sin and death, Your living presence among us. Amen. 5. Prayer for Deliverance My Lord, you are all powerful, you are God, you are Father. We beg you through the intercession and help of the archangels Michael, Raphael and Gabriel, for the deliverance of our brothers and sisters who are enslaved by the evil one. All saints of Heaven, come to our aid. From anxiety, sadness and obsessions, we beg You. Free us, O Lord. From hatred, fornication, envy, we beg You, Free us, O Lord. From thoughts of jealousy, rage, and death, we beg You, Free us, O Lord. From every thought of suicide and abortion, we beg You, Free us, O Lord. From every form of sinful sexuality, we beg You, Free us, O Lord. From every division in our family, and every harmful friendship, we beg You, Free us, O Lord. From every sort of spell, malefic, witchcraft, and every form of the occult, we beg You, Free us, O Lord. Lord, You Who said, “I leave you peace, My peace I give you,” grant that, through the intercession of the Virgin Mary, we may be liberated from every evil spell and enjoy your peace always. In the name of Christ, our Lord. Amen.